Laura asked me if I wanted to do a half marathon in Branson. I agreed if she promised to not become pregnant again. She assured me she was more than finished with that phase of her life and we both signed up. By this time I had already signed up for two other halves and a full marathon so what is one more. She and her husband have a place at table rock lake so we could stay there. I was supposed to work Friday evening until seven so we ended up leaving Saturday morning around nine. It took us about five hours to get down there and we went straight to pick up our packet. After that Laura said let’s go to the outlet mall. She knows I am not a big shopper but I was like this sounds like a good idea. And so we went and I bought quite a bit of stuff. I found myself a really cool pair of orange under armour running pants which I ended up wearing to the race. We finally made it back to her place around seven where we rested for a short time and then went and had dinner with her husbands parents. They were really nice and reminded me of my own in-laws. I told Laura she really had a great set of in-laws and she agreed. We finally got in for the night around ten and I didn’t fall asleep until eleven thirty. The next day we were up at six thirty as the race started at seven forty-five. I did not get my pre race coffee and then my phone went dark and I couldn’t get it to work. So for this race it didn’t rain but I ended up with no music and no idea what kind of pace I was at. Oh and let me also throw in I had changed my diet to low carb and high fat two weeks ago and am not anywhere close to being able to do thirteen miles on no sugar. But I started out carrying a package of sports beans in case I was dying anytime after mile six. By mile three I had some Gatorade at the water stop and I did end up eating my sports beans. The race had an insane amount of hills, so much so that my Fitbit logged ninety-eight flights of steps. So we finish that and do even more shopping. We walked another five miles after the race. We stopped in some shoe store so she could look at Birkenstocks. I started eyeing up a couple of shoes and this super nice salesman had me try on Chaco’s. I gave him the song and dance about how I couldn’t tolerate anything between my toes and have never been able to tolerate flip-flops. So first he had me put on the style without the toe stabilizer and the feel was amazing. I have never felt that kind of arch support since the original sketcher go run shoe. Although these were even better. So he then has me put on a shoe with a toe and he was right, it didn’t bother me at all. So I walk out of that store with a pair of sandals that I plan to wear all summer. Next we hit up the candy store and I’m so glucose deprived that I go insane and buy about three pounds of candy with plans to have a few pieces and pawn the rest off on my kids. After the spending spree we go back to her place to shower and get ready to leave. On the way out, I decide I’m in a sugar coma anyway I’m drinking a diet Dr. Pepper. By this time Laura starts to feel bad and I said I’m a big kid and I could have not bought anything and not eaten candy and drank soda so don’t worry. We got back in town around nine-thirty and before I go to bed I decide I must have my toes done so that I can wear these new fancy sandals. Yesterday I could barely get out of bed, so today I drug Emily to the nail place. I am sure most of you are shocked that I didn’t pick orange but I wanted them to match the new sandals. They had pink and purple in them and Emily found this fantastic purple color so I stole it from her. And my shoes can also be used for hiking. They have a lifetime guarantee and can be resoled every five years. This would be a Brian Moehlmann dream come true since he thinks my running shoes should last forever. I only wish I could run in them because the arch support is fantastic and much better than my seven hundred-dollar custom orthotics. What started out as a run that only cost to entered it, turned into a huge shopping spree, a candy binge, a soda binge, new shoes, new toes, sore legs and a great time. I did realize that although I still think I’m twenty in my head, my body says oh no you are not and two days later, I’m still not fully recovered! Mole moral~If Laura asks you to do a race with her, work a few extra shifts and get plenty of sleep the week before. And for crying out loud do not decide to go low carb two weeks prior! Birthday’s and Christmas’s are always interesting around the Mole house because one never knows what Brian is going to come up with as a gift. This year my birthday fell on Mothers day so anyone who is thinking it’s a double score would be wrong. Brian tells me every year “you are not my mother” and doesn’t even get me a card most years. I have many people share with me either their own father said that to their mother or their husbands say it to them so at least I am not alone. Brian and Allyson had planned to go to our property on Saturday to plant the persimmon trees Brian received from Indiana this past week. Side note, he decided to plant these next to the plot he and Johnny (his best friend and co-owner of the property) tilled up and planted to feed animals. These trees fruit attract even more critters. Talk about a cheating way to shoot a deer. He denies that it is cheating so I call unfair advantage or something. On Thursday Brian was informed he would have to work Saturday which messed up all the plans. I assured him he and Allyson could still go on Sunday, it was ok a little alone time isn’t a bad way to spend a birthday and mothers day. I slept in on Sunday and woke up around 8:30. Brian had left for the lake an hour before and woke me up two or three times asking me stupid questions. I played on my phone for about thirty minutes before I ventured out into the kitchen to see what my present was this year. Let me do a little explaining and start with the gift bag. It’s a known fact we never have the correct paper or bags for the occasion so we usually use whatever we find first. I asked him about the Diet Dr. Pepper because he knew I gave up sugar and fake sugar a week ago. He says well I thought you could have a couple of glasses to which I said and go through withdrawal again, no thanks. This week is national healthcare week and the unit is celebrating all weeks so my co-workers will enjoy it. I have eaten all the bread and butter pickles three different times before he could get any. So he bought me them. They are really good but have some sugar in them so I told him I can only eat two or three a day instead of the entire jar in two days. (Not a bad thing, really). I asked him to buy sunflower seeds so we could plant them. Well I discovered I could grow the dwarf ones in flowerpots so that sent me to The Home Depot around noon. I picked out six nice sized pots and said oh heck no they aren’t staying this ugly neutral color. I whipped out my paint and am painting them. I think it’s going to take six coats of paint before the base coat looks right. Then I plan to decorate each one. I am considering one to say The Moles and then the other five done in ways that describe each of us. I haven’t decided of sure. So that two dollar gift is turning into a fifty dollar project. I am sure everyone is thinking forget that stuff what is the cigar all about it. Back when Kayla and I visited Missouri State and ate at Lambert’s cafe my meal came with a cigar. It has been laying around the house ever since. Anytime I work day shift (as in leave the house at six in the morning) Brian will find some bizarre obscure object and put it in my lunch box when I am not looking. Here are some example of stuff I have found in my lunch, a small pumpkin, a hair bow, a lighter, an eraser, and Kayla’s inhaler among other things. So I was not surprised at all to find a cigar in my birthday present. Mole Moral ~ Sometimes the best gifts come stuffed in a Christmas bag or your lunch box. I have been running off and on with my small group from church when I am not working. We had all signed up to do a 5K or 10K this morning. This race actually benefited ALS and I was planning to run in memory of Bob Stehlin, a friend who lost his battle with ALS about 18 months ago. Packet pick up was in Webster Groves really close to a couple of cakes I had seen back when I was obsessed with cake hunting. I could not figure out where the race started so I asked the guys who were handing out the race packets. They told me it was at the high school just down the street and the race started at nine. They recommended arriving around 8:25 to allow time for parking and getting to the start line. This morning I woke up at 6:30 with plenty of time to goof around before I had to leave. I arrive at 8:25 at the finish line and see people finishing the race. Thanks to the beauty of smart phones, I got on-line and discovered the race started at eight. I was so upset I nearly burst into tears and knew there was no way I could wait around for my friends to finish running. I am not going to lie, I felt really stupid for having the wrong time and also I had my heart set on running. So I decided I would drive to Grants Trail and do my 10K there. I arrive at Grants Trail and decided to go the opposite way on the trail. (I start really close to Grant’s farm which is kind of at the mid-point.) I have wanted to run across the section that crosses over 44 for a while now. So I head out with no water because I am supposed to be doing a race and that is provided. After two miles into the other way I was ready to kill myself for my stupid ideas. It was a slow uphill climb for like a mile and a half. I was trying to run the entire thing but after two miles I had to give that dream up. Between the uphill and the going low carb a week ago, it wasn’t going to happen. I did run much father this time than Wednesday when I tried running on the low carb. Anyway I’ve done reading and research and with time it should not be an issue. My game is endurance and not speed so I should be able to do just fine burning fat instead of sugar. While running the trail I passed two of these signs. That is the race I was supposed to be doing. So I thought to myself, I’m so glad I didn’t pull a rookie move and wear the race shirt to the race. We learned last semester in group that you aren’t suppose to wear the shirt until after you’ve finished the race and earned the shirt. If I had the shirt on, well it would have been awkward. Then at about mile 2 1/2 I spotted this beauty and knew I would stop and photo it on the way back. I had seen every cake at its original location back in the day and I knew this one was not where it originally was. But it was cool to see one again and reflect back on so many good memories with the kids and cake hunting. I am not sure why I missed this race. Normally I would say God had a reason, but this sounds even more crazy than normal. I mean this race was with my God friends. Perhaps had I run the thing, I would have tripped and fallen and broken my leg. I am not really sure. Mole Moral ~ This isn’t the first race I’ve missed because I had the time wrong, I sure hope it’s the last. Seriously, I might need nursing home care! 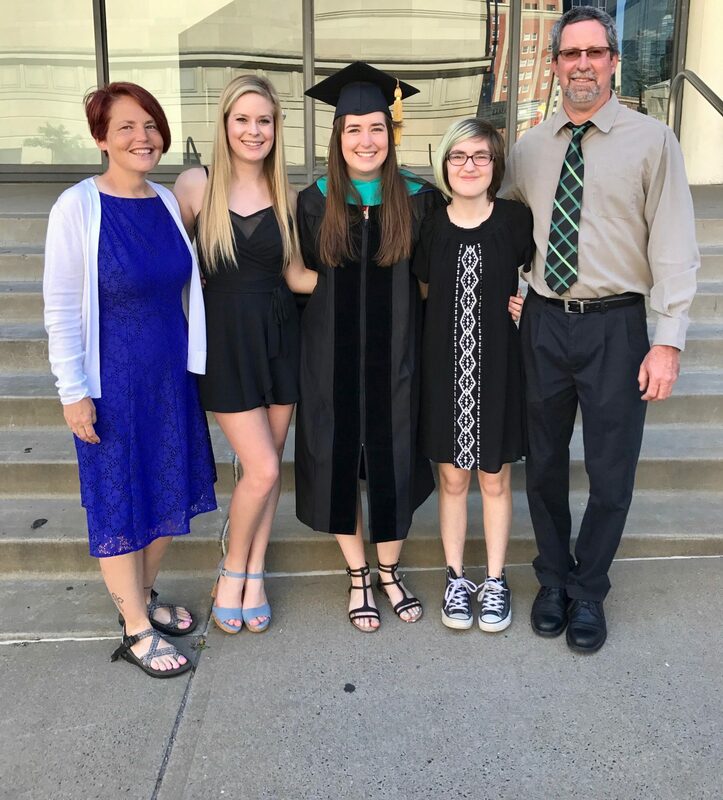 This past Friday was Emily’s white coat ceremony for Physical Therapy School. I am not sure what I expected at the ceremony but it certainly wasn’t to be a blubbering mess. I found myself tearful on several occasions. Firstly, it reminded me of all those years ago (1986) when I received my cap from Debbie Dutton (a third year Deaconess student). I didn’t know any nurses who could have capped me but I picked her because I admired her so much and I could barely speak to her. I was very shy back then. This was a huge deal as well and after that we had to wear these crazy caps to clinical’s. They had a speaker who had graduated from the physical therapy program twenty years ago. She was fantastic and when she spoke about how nervous she was when she first started clinical’s because she was going to be in charge of real patients and what if she missed something or killed someone. And it was at the moment i realized two things. Firstly, physical therapy is way more closely to nursing than I ever realized and secondly, new nurses also feel this way. Here lately at work we have had a fair amount of new nurses start on our floor. This caused me to remember my very first day of orientation which I have shared with some of the girls over the years. Anyway I was working at Deaconess on the renal, ENT, and GU floor. We walked into our patients room who had a laryngectomy and had a laryngectomy tube. This is similar to a trach but bigger. He happened to cough right as we walked in and out flew his tube and landed on the floor. I was thinking what the hell had I gotten myself into but my preceptor walked over and picked it up off the floor, rinsed it, stuck the obdurator back in and shoved it back in his neck as if it happened all the time. Later I would realize that was the only time that ever happened in the two years I worked there. Had my preceptor flipped out, I might have ended up a totally different nurse. So clinical instructors and preceptors are very important in shaping a future nurse or physical therapist. I do not precept new nurses because it makes me nervous and I do things my way which isn’t the best way to instruct new people. I am however a resource and will answer any question or show anyone how to do anything. Next they did the blessing of the hands which I thought was wonderful and really wished nurses did this. Each student took oil and wrote the letters P on the palm of one hand and T on the other hand. It must have been super oily because the look on their faces was hysterical. And after it was over I began to reflect on physical therapy because as a nurse they have always been a pain in our neck. They always call “can I work with your patient in room x”. I want to say don’t call me just do it but I am sure they are taught this way. They always seem to get the biggest patients up all by themselves and then they leave. It always takes five nurses to get them back to bed. If you don’t believe me and need a good laugh please click to view this PT vs Nursing. Emily and I watched it together a year or so ago and were laughing so hard we could barely breath. I really never recognized that they also have a healing touch. That they can seriously injure a patient just like a nurse. That they have to be mental therapists just like nurses because you just can’t teach a patient to walk again without learning a whole lot about his background and what kind of environment he comes from. Mole moral ~ Perhaps those physical therapists with their gait belts permanently attached to them aren’t so bad after all. If they would only put the patients back to bed, life would be well PERFECT! Friday morning kayla and I got out of bed at 5:30 and 5:55 to drive up to Warrensburg to visit University of Central Missouri. I will not lie, I had never even heard of it. Back when Kayla was deciding where to apply I had went to the State Board of Nursing site to see which school had the highest pass rate for nursing boards. At one time it was Missouri State but UCM was at the top with 97% so I said apply there too. This was an individual visit as we had missed the campus visit day because of work conflict schedules. It was really nice and very individualized. A current student took us on a walking tour of the campus and in and out of the building. I must say the library is huge! The campus is smaller than Missouri State and they don’t have near the amount of stadiums and fields but that was ok. After that we met with a lady who went over what credits would transfer in. All of Kayla’s will except two classes that were like how to survive college. She was very happy to see that Kayla had not taken all of her pre requisites for nursing because that would count against her. She has mostly finished the general education stuff. This was the first school that didn’t give us the you need to have a 3.75 GPA to be even considered for the nursing program so it was nice seeing you. They said they have found that GPA does not really determine who would make the best nurse. Obviously because I had a 3.4 in high school with a 24 on the ACT and I am a rockstar nurse. They base admission on grades, a personal interview, extracurricular activities and volunteer work. I was so happy to hear this as I always thought admission based on GPA alone was unfair. There are many nurses that I have encountered over the years that were rockstar but not straight A students. The mascot is a mule and his name is Mo. I found this hysterical since my husband is often called Mo by his friends and golf buddies. When we first got information from this place he immedialty yelled “jackass” and every time we mention it he yells “jackass!” Our household is so mature. In his defense, on the way to his brothers house, a guy has two donkeys that can be seen from the street. He never misses his chance to yell “jackass”. So Kayla needs to choose between a bear or a mule within the next week. It’s time to sign up for housing before she ends up living in her car for the year. Also, food is Kayla’s life and she found out they were moving Chick-fil-A to the basement and getting rid of Burger King and putting in a Steak N Shake were Chick-fil-A was. I thought she might sign the papers right then and there. The campus has three Starbucks and either one or two Einsteins Bagels. Who could go wrong with those food options, not counting the smorgasbord in the university cafeteria. Mole moral ~ If Kayla does indeed choose UCM and becomes a nurse her father will probably always call her the “jackass nurse”!